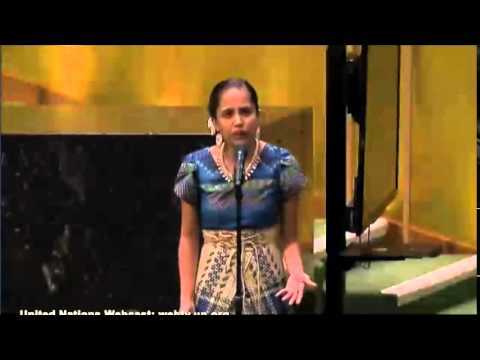 Video of Kathy Jetnil-Kijiner, Civil Society Representative from the Marshall Islands at the Climate Summit at United Nations Headquarters in New York. Marshall Islands native Kathy Jetnil-Kijiner recited a poem in the form of a message to her infant daughter that won a standing ovation at the U.N. Climate Summit in New York. An official U.N. Twitter account said some of the 120 world leaders listening to her speech were moved to tears. The Marshall Islands, along with small island nations such as the Republic of Kiribati, are among the nations that will be most devastated by climate change.